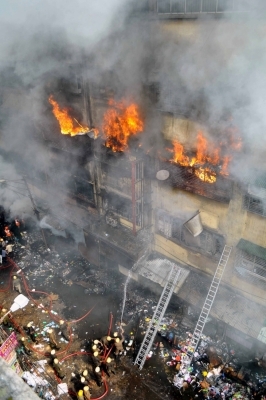 Kolkata Sep 16 (IANS) A massive fire broke out in Central Kolkata s Bagri Market on Sunday but there were no reports of any casualty or injury. "The fire erupted around 2.45 a.m.. Almost 30 fire engines have been deployed. We are trying our level best to bring the fire under control " the official said. West Bengal Chief Minister Mamata Banerjee said: "There is no report of any casualty or of anyone being trapped inside." Mayor Sovan Chatterjee rushed to the spot and said: "It is very difficult to douse the massive fire. The road is very congested the fire-fighters are finding it difficult to place the ladders. The fire is spreading to different floors." He said the building was filled with inflammable materials. Angry businessmen lamented that the fire couldn t be controlled even after the passage of almost 10 hours. "We have suffered a massive loss before Durga Pujas " said a woman.